Help! My favorite food, peanut butter, has been recalled. 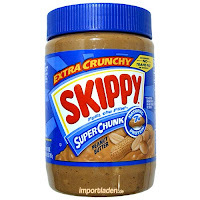 Although most of the concerns deal with PB products I don't eat (I'm a straight-out-of-the-jar gal)--most recently Austin snack crackers and Little Debbie snacks--I have to admit I'm a little scared to keep it as a daily staple. The FDA lists the products in danger on its website and states that name brand peanut butter sold in grocery stores most likely isn't affected. Yet it's still advised to avoid products that may contain peanut butter while testing is still taking place. So what's a girl to do? Fortunately there are still other ways to get that peanut fix and its benefits. P.B. Loco. This company came from three individuals who wanted to open a peanut butter store in 2003. Now they jar their crazy concoctions--asian curry spice, banana, raspberry white chocolate--for the masses and available at specialty retailers and online. Whole Foods. Hopefully you can't go wrong opting for the freshly-ground peanut butter made on-site from the peanut grinder. And its jarred peanut butter made of peanuts and salt is always a winner, especially right now since it's not listed among recalled products. Trader Joe's. I can usually get by without peanut butter simply by visiting the nut section at Trader Joe's. Between the blister peanuts and the roasted peanuts, I'm always satisfied peanut-wise, but I'm also a fan of any of the other nuts, too. Peanut Butter & Co. Break from the norm and try peanut butter mixed with sweet and spicy extras like white chocolate, dark chocolate, honey, maple syrup, hot spices and cinnamon raisin. The company also posted a notice that its peanut butter is not affected by the recall. Yay! Yay for peanut butter products that don't appear to be affected by the recall. I don't think I could go without its stomach-filling qualities, and appreciate its lack of trans fats. Even though peanut butter was once touted as having too much fat for daily consumption, studies have shown its cholesterol-reducing powers. Richard Mattes, Ph.D., R.D., a professor of nutrition at Purdue University, says that peanut butter has been associated with lower total cholesterol, lower ldl/bad cholesterol and lower triglycerides which can positively affect cardiovascular-disease risk. Read more about peanut butter in an article by CNN and Cooking Light.